The lumen geometry used here was provided by Dr. Ryo Torii (University College London). It was extracted from the computed tomography model of a bifurcating segment of the middle cerebral artery of a 67 year-old female with aneurysm. The arterial wall (i.e. the structural mechanics part of the problem) is modeled with the continuum element made of hyperelastic (Fung) material. The numerical methods used in this computation were introduced and implemented on parallel computing platforms by the T*AFSM. The set of numerical methods introduced by the T*AFSM over the years and used in this computation includes the DSD/SST formulation [1-4], the quasi-direct FSI method [5, 6], the stabilized space-time FSI (SSTFSI) technique , and special techniques for arterial FSI computations [8-11]. The lumen geometry was used earlier in simulations reported in [12, 13]. The inflow volumetric flow rate is calculated (see ) from the maximum-velocity waveform used in . 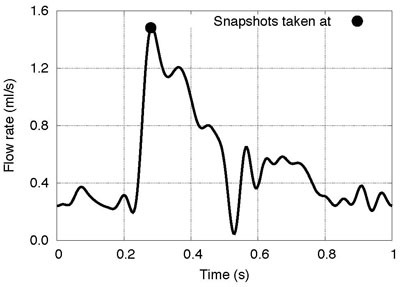 The inflow volumetric flow rate is shown in Fig. 1. 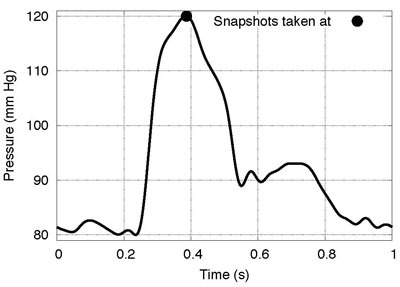 The inflow velocity profile (in space and time) is calculated (see ) based on this volumetric flow rate by using a special mapping technique introduced in . The traction condition imposed at the outflow boundary during the cardiac cycle is based on a normal blood pressure profile, which is calculated (see ) by using the Windkessel model and the inflow volumetric flow rate. The pressure profile is shown in Fig. 1. 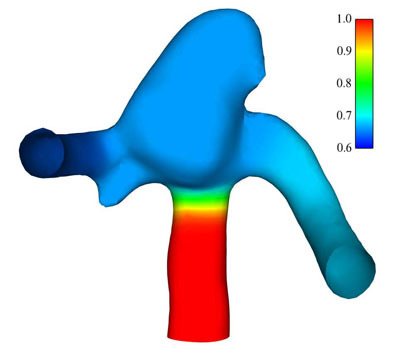 We use a variation of the "estimated zero-pressure arterial geometry" method that was introduced in . In this variation (see ), we use variable wall thickness for the artery. Fig. 2 shows the zero-pressure configuration and the wall thickness normalized by the wall thickness at the inflow. The structural mechanics mesh is shown in Fig. 3. One of the special arterial FSI techniques used in the computation is generating layered, high-refinement meshes near the arterial walls to improve the boundary layer resolution (see [10, 11]). 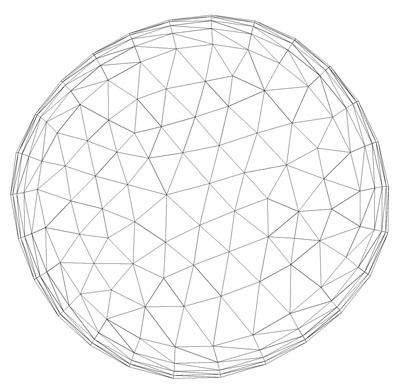 For the purpose of comparison, we also compute with a coarser mesh. The coarse and fine meshes have the same triangular mesh at the arterial wall, which is shown in Fig. 4. The coarse and fine fluid mechanics meshes at the inflow plane are shown in Fig. 5. The layered, high-refinement meshes near the arterial wall give us higher-resolution wall shear stress values (see Figs. 6-8). For more details on these computations, see . We typically use two layers of elements across the arterial wall structure, which we believe to be sufficient. To evaluate the performance of the structural mechanics mesh with two layers of elements across the arterial wall, we tested three additional structural mechanics meshes under a prescribed traction over a cardiac cycle. The prescribed traction comes from the fine mesh FSI computation. The structural mechanics mesh properties are shown in Table 1. The only difference among the hexahedral meshes is the number of element layers across the arterial wall. The tetrahedral mesh is based on a triangular surface mesh which is the same as the fluid interface mesh in the FSI computations. All meshes have the same number of nodes at the inlet and each outlet boundary. The results for all hexahedral meshes are geometrically almost identical during the cardiac cycle, while the tetrahedral mesh results in a slightly different geometry. 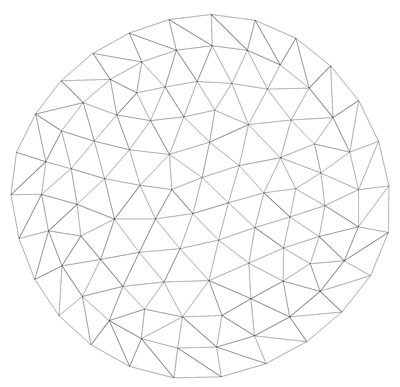 When we rotate and translate the deformed tetrahedral mesh, the geometries are very similar (see ). Since the results are geometrically almost identical, we provide lumen volume as a quantitative measurement of the differences. Each mesh volume, as a percentage of the volume of the hexahedral mesh with four layers, is shown in Table 1. These volume ratios remain almost constant throughout a cardiac cycle. Fig. 1. Volumetric flow rate and outflow pressure profile, with the maximum value marked. For details, see . Fig. 2. Zero-pressure surface configuration colored with normalized wall thickness. For details, see . Fig. 3. Structural mechanics mesh. For details, see . Fig. 4. Fluid mechanics mesh at the arterial wall. For details, see . Fig. 5. Coarse and fine fluid mechanics meshes at the inflow plane. For details, see . Fig. 6. Wall shear stress for the coarse mesh when the volumetric flow rate is maximum (left) and when the outflow pressure is maximum (right). For details, see . Fig. 7. 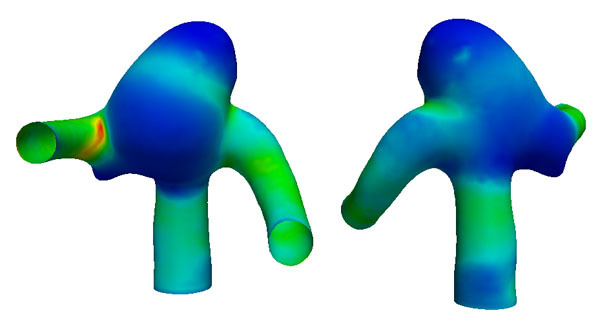 Wall shear stress for the fine mesh when the volumetric flow rate is maximum (left) and when the outflow pressure is maximum (right). For details, see . Fig. 8. 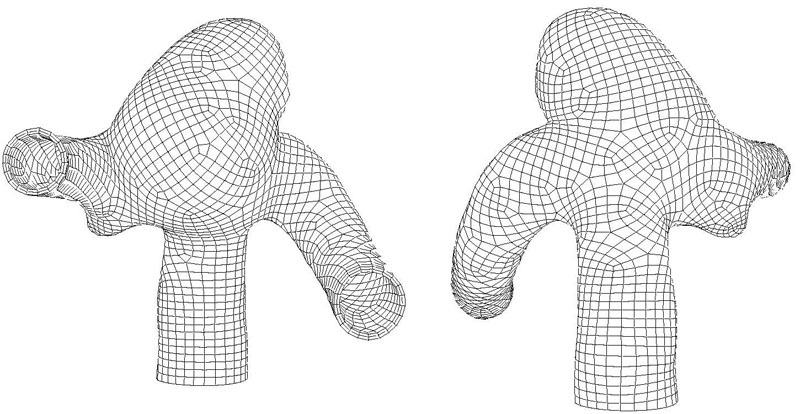 Time-averaged wall shear stress for the coarse (left) and fine (right) meshes. For details, see . Table 1. Volume ratios for different structural mechanics meshes. For details, see . 12. R. Torii, M. Oshima, T. Kobayashi, K. Takagi and T.E. Tezduyar, "Numerical Investigation of the Effect of Hypertensive Blood Pressure on Cerebral Aneurysm -- Dependence of the Effect on the Aneurysm Shape", International Journal for Numerical Methods in Fluids, 54 (2007) 995-1009, doi: 10.1002/fld.1497. 13. R. Torii, M. Oshima, T. Kobayashi, K. Takagi and T.E. 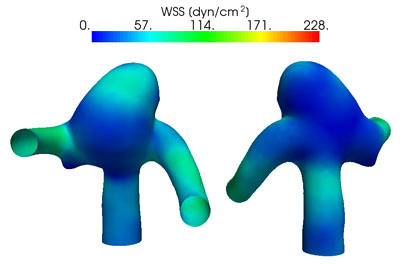 Tezduyar, "Fluid-Structure Interaction Modeling of a Patient-Specific Cerebral Aneurysm: Influence of Structural Modeling", Computational Mechanics, 43 (2008) 151-159, doi: 10.1007/s00466-008-0325-8.